Gaucin, the first Serrania de Ronda village encountered by the traveller on the road which links the Campo de Gibraltar region with Ronda itself, displays all the charms of the white villages which from here onwards can be seen nestling in the mountains through which the River Genal flows; its streets, of Moorish design, are perfectly adapted to the hill on which they are built and its graceful whitewashed houses are boldly decorated with grilles and balconies expertly crafted from wrought iron. At the top of the village, adapted, naturally, to the rock on which it stands is the centuries-old El Aguila Castle, which is aptly named, as from it the eagle-eyed can view the African coast, Gibraltar, the River Genal and the open countryside which marks the final descent of the Genal as it meets the River Guadiaro. An obligatory port of call for any serious traveller, it is no surprise that Gaucin has stamped its unforgettable image on many a famous retina: authors such as Richard Ford, Francis Carter and Gerald Brenan felt the need to try to put their experiences of Gaucin into words. The affable, open character of the local people must certainly have played a part: in the words of the village coat of arms, they are noble, loyal and hospitable. Though of Roman origin, the village acquired greater importance during the Moslem period. The village grew under the protection of a fortress built by the Arabs on the site of an old Roman castrum. This fortress, today called Aguila Castle and practically in ruins on its lofty rural perch, gave the village its name: “Sair Guazan”, meaning “strong rock”. Its strategic location made it practically impossible to breach, and it proved to be one of the most difficult fortresses to conquer in the struggle between the Christians and the Moslems. ccording to chronicles, Alfonso Perez de Guzman, known by the Christians as Guzman the Good, lost his life in an assault on this remarkable castle in 1039. Another important episode in the history of Gaucin occurred during the War of Independence, when, thanks to the support provided by English troops from Gibraltar, it became an important focus for resistance to Napoleon’s troops, whose harsh response in 1810 was to raze the village to the ground. 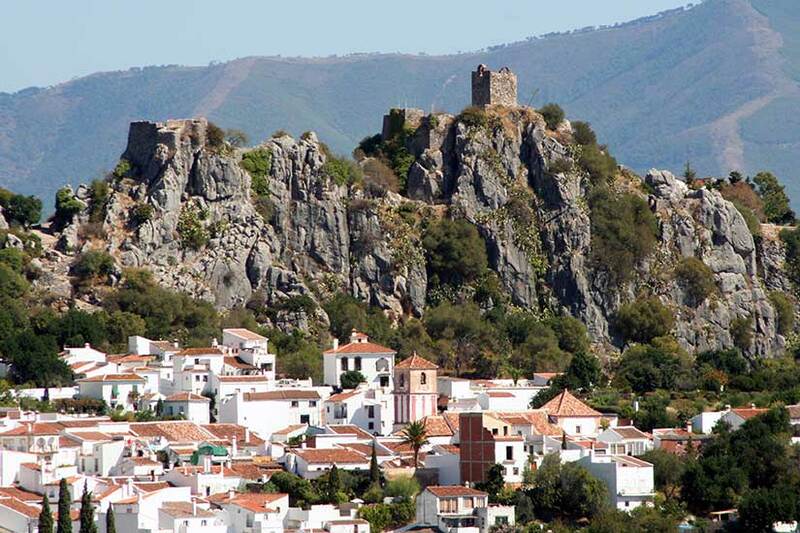 In the late 19th and 20th centuries, Gaucin enjoyed a period of prosperity as a natural link between the coastal strip stretching from Estepona to Algeciras and the Serrania de Ronda region, benefitting from the commercial transactions carried out between these two areas.